I stumbled across the Graphic Library series from Capstone Press. It's a series of around 150 graphic novels aimed at 3rd and 4th graders covering a wide range of history and science. Each book covers a single topic: hurricanes, the Battle of Gettysburg, the first moon landing, the life of Harry Houdini, etc. They're high-level summaries, only clocking in at 32 pages each, and are told in broad strokes that nine and ten year olds could readily absorb. Despite the low page count, they're square-bound and have a bit more heft to them than a typical monthly pamphlet comic. 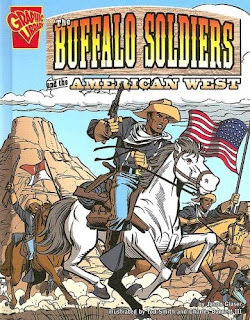 I read through The Buffalo Soldiers and the American West, one of the many, many topics woefully skipped over entirely in my public school history classes. After the Civil War, the government promoted westward expansion through the Homestead Act. Not surprisingly, the Native Americans were often not thrilled about this, and fights occurred from time to time. (This much I did learn in school.) The government wanted to sent armed forces out to protect the Homesteaders, but didn't feel it was fair to send all these troops out to fight under harsh conditions so soon after the Civil War. So they sent out African American troops. Despite having the worst supplies and harsh treatment from their white superiors. (Blacks weren't then allowed to be officers.) These troops were so effective and powerful, the Native Americans started comparing them to the ferocious buffalo. The troops went on to round up Mexican bandits and Native American "troublemakers" like Sitting Bull and Crazy Horse; they went on to serve valiantly with the Rough Riders under Teddy Roosevelt, and continued on through the Spanish-American War up through World War II. Their long unsung bravery led Colin Powell to dedicate a memorial to them in 1990. As I said, this is a book aimed at kids. The language is pretty simple, and there's not a lot of nuance to the story or art. That said, it's well done and does a good job taking advantage of both the words and pictures. That is, it's definitely NOT just a straight narrative with some illustrations. The text and imagery are very well-integrated. The other interesting thing here, and one of the reasons I opted to look at this book over some of their other titles, is to see how they handled racism and bigotry. Obviously, during that time in American history, any non-Caucasian was looked down upon. But for kids of that age group, you probably don't want to include the derogatory epitaphs or depict lynchings or anything. This is where the book REALLY surprised me. The poor treatment of blacks was definitely not glossed over at all. They flatly state that a lot of whites didn't like African Americans and treated them poorly, like sending them out in the place of white soldiers and only providing inferior equipment. But once they're out West, the story largely focuses on their bravery and military successes. It comes across as an almost Campbell-ian hero's journey, just using an entire cavalry troop instead of a single individual. But the REALLY elegant part is the depiction of the Native Americans. The Buffalo Soldiers are clearly the heroes of the book (they're the ones it's titled for, after all!) and the were largely created to deal with Native Americans. But rather than making the Native Americans the bad guys, they're actually depicted as people who were cornered into oppressive and unfair circumstances. Not victims, mind you, and not as noble, ignorant savages. They're simply shown as what they really were. It's an incredible balancing act. The American Indians aren't really to blame for resisting their lands being forcibly taken away and their food supplies slaughtered. So you can't depict them too poorly, despite them needing to play the role of the villains here. The Buffalo Soldiers chase down a lot of these Native Americans unfairly on the orders of their superiors, but they're supposed to be the heroes so you don't want to really put any significant faults of conscience on them. If there's a real bad guy here, it's the (broadly labeled) U.S. government but you don't want to depict them too badly either, since they were the ones ordering the Buffalo Soldiers around in the first place. Amazingly, writer Jason Glaser handles all of those angles superbly such that the reader still roots for the heroes, but doesn't really disparage the villains. I suppose, in that sense, it's not a 100% fair assessment of history but A) you can't reasonably provide ALL the details and nuances and expect children to comprehend them, and B) it's still more accurate than any school history book I've ever seen/read. Now, Glaser hasn't written all of the books in this series, but if this is any indication of the level of expertise going into these, I heartily recommend the whole series to anyone with kids in that age range.